﻿ Hermanus Beach Villa Hermanus. JIMAT di Agoda.com! Ada soalan mengenai Hermanus Beach Villa? Terletak di Voelklip, Hermanus Beach Villa merupakan tempat menarik untuk memulakan pengalaman di Hermanus dan kawasan sekitarnya. Terletak 5.2 Km dari keseronokan bandar, hotel 4-bintang ini terletak di lokasi yang sangat baik dan menyediakan akses kepada tarikan terbesar di bandar. Hotel moden ini berada di sekitar kawasan tarikan bandar yang popular seperti Fernkloof Nature Reserve, Hermanus Country Market, Quirk & Leopard. Di Hermanus Beach Villa, perkhidmatan yang cemerlang dan kemudahan yang unggul menjadikan penginapan anda tidak dapat dilupakan. Tetamu hotel boleh menikmati kemudahan seperti Wi-Fi percuma semua bilik, pengemasan harian, pendiang api, simpanan bagasi, Wi-Fi di tempat awam. Alami bilik dengan kemudahan berkualiti tinggi sepanjang anda menginap di sini. Sebahagian bilik menyediakan televisyen skrin rata, internet wayarles, internet wayarles (percuma), bilik larangan merokok, penyaman udara untuk memudahkan tetamu berehat dan kembali bertenaga. Hotel ini menawarkan pelbagai kemudahan rekreasi yang sangat baik, termasuk padang golf (dalam jarak 3 km) , taman. Apa juga tujuan lawatan, Hermanus Beach Villa merupakan pilihan yang terbaik bagi penginapan anda di Hermanus. Sila ambil perhatian bahawa merokok adalah dibenarkan di balkoni. Kanak-kanak lebih muda mungkin diterima atas budi bicara pemilik. Spent 4 nights in this well located guest house, the manager Cristo being a very attentive host who ensured all staff were likewise. The breakfast was a delight with extremely good selections including cooked choices at your request. The whole building was converted/developed in 2011 and unfortunately is now tired and ready for refurbishment, would we stay here again? Of course, as it offers seclusion, safety and excellent local restaurants and beaches all within short walking distance along cliff walks or local roads. Great location at the ocean, very friendly staff and a great breakfast (with whales in the background if you're lucky!). Also at walking distance from a great steakhouse, and located in a quite area so a guaranteed great sleep with the ocean in the background! We had a lovely stay in Hermanus. We visited during the Whale festival and the views from our room of the whales in the sea did not disappoint! The staff were all extremely friendly and breakfast was delicious. Thank you! Hotel is immaculate and Lianne was very friendly and welcoming and very helpful throughout our stay. We only stayed for 2 nights and I wish we had extended our stay. The location was perfect for whale watching and we even saw some from our balcony(dolphin suite) on the first afternoon. The free return shuttle in the evening meant town was easily accessible for a meal ( it was a long walk on the cliff path if you factor in the stops for the breathtaking views(look out for the rock dassies).very enjoyable stay. Disappointing. It is a B&B and not a hotel. They are a 10 min drive to Hermanus Town. Just felt we had been duped! beautiful room with oversize bed, great breakfast, lovely owners giving great tips! One of our best stays on our garden route trip in south africa! Owners gave us great tips and even made our shark cage dive happen with the right tips, despite cancellations in other areas! very romantic too!!! It is a very nice Villa nearby the Beach. We had a very clean spacious room with overlooking the ocean. The best was that we could watch some whales right from our window, it was amazing. Breakfast had good selection with tasty decoration. Staff are friendly and we did enjoy our stay there. Very pleasant. I will definitely return and will recommend to all my friends. Ideal for sightseeing and good dining. Position relative to where we needed to be, breakfast, sea view. My boyfriend and I stayed at this villa for 2 nights and enjoyed our stay so much that at some point, we refused to head outdoors. 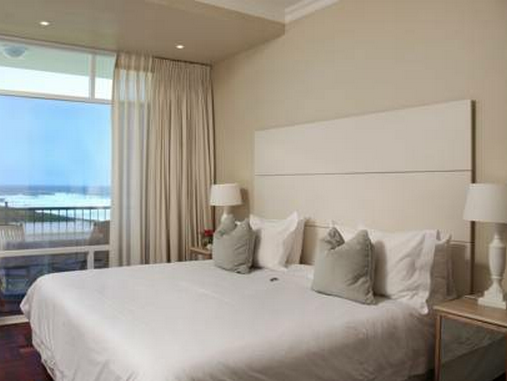 Lodging/room – The lodging overlooks the Atlantic Ocean and we could watch the whales from the balcony of our room. We stayed in Dolphin room A which was on the top floor. 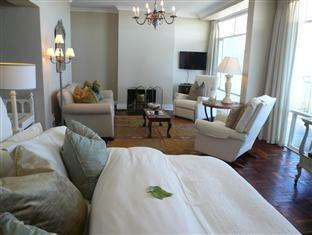 The room was spacious, bright, and clean with white contemporary furnishings. The bed was 5-star standard and extremely comfortable. The shower was also commendable, producing an invigorating flow of water and steady temperature. Free but limited wifi access was available. Food – One of the better breakfasts we have had amidst the high standards set by various lodgings/B&Bs along the Garden Route. There was a wide breakfast choice, continental, Full English, French toasts etc. Service/Staff – Excellent staff who are helpful and prompt in making trip arrangements and restaurant bookings for us. We were also treated to some complimentary wine in the room upon arrival, and the staff brought us hot water bottles at night even though the plush quilt covers were sufficient to keep us warm. Parking – Parking was alongside the beach villa, on the grass patches, not in private lots/garages but safe. 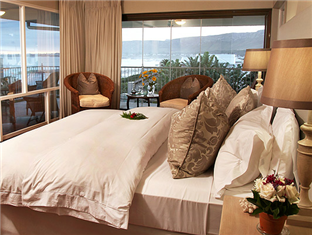 We would definitely recommend this beach villa to those visiting Hermanus. Zu Gast bei dem Besitzerpaar fühlten wir uns rundum wohl. Das Personal ist sehr aufmerksam und freundlich. Lediglich die Tatsache, dass das "alte Südafrika" mit einem für unseren Geschmack etwas zu konservativem Führungsstil der Besitzer dem Personal gegenüber zum Vorschein kam, hat den Aufenthalt dort etwas getrübt. Die Unterkunft befindet sich in unmittelbarer Nähe zum Meer. Zimmer sind geräumig und sehr praktisch eingerichtet. Das Personal war in jeder Hinsicht hilfsbereit und freundlich. Das Frühstück war in jeder Hinsicht ausreichend. Das Haus liegt in einem ruhigen Gebiet, am Rand von Hermanus. Ins Zentrum von Hermanus fährt man mit dem Auto ca. 10 Minuten. Als störend empfanden wir, dass der Fernseher im Frühstücksraum lief. Wir mussten jedoch bald feststellen, dass das in Südafrika anscheinend in allen Unterkünften üblich ist. Andere Gäste scheinen diese Art des Frühstücks anscheinend zu bevorzugen. Andere Länder andere Sitten.